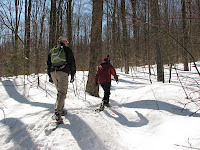 Vermont State Parks is excited to be hosting nine guided hikes on New Year's Day. Start off your New Year's resolutions on the right foot by getting outdoors and being active on the first day of 2012! 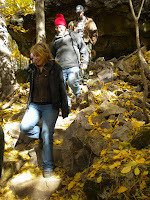 We hope you'll join our experienced guides for a free family hike in one of our state parks. Remember to dress for the weather, bring snowshoes (if there’s snow), and bring your own beverages/snacks. Dogs are welcome on a leash, and most importantly, have fun! No registration is required. For status of a hike or other updates, please call 802-241-3663 on 12/31 and 1/1. See details for each hike below. Harpoon's "Vermont Spruce Tip" Ale Made from Vermont State Forest Spruce Tips! ﻿ ﻿﻿Harpoon Brewery's, Tom Graham, recently created a specialty beer for the fall/winter season named Vermont Spruce Tip Ale using spruce buds harvested from Downer State Forest in Sharon, VT (Vermont's second state forest). 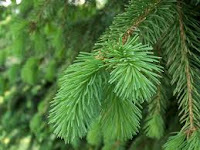 Drawing his inspiration from the book, The Homebrewer's Garden, Tom sought out the help of State Forester, Tim Morton who knew just the right place to harvest the beer's main ingredient, young spruce tips. That's right, save some green during this holiday season, by visiting a Vermont State Park (it's FREE day entry and primitive camping during the off season!) Take advantage of the fresh air and the prime views, by enjoying time outside with your friends and family in a nearby Vermont State Park. Deciduous trees have shed most of their leaves, so usually hidden views can now be seen. Below are five best hikes for friends and families to take after celebrating Thanksgiving. In addition, try doing some fun things while hiking - see below. Take a relaxing walk in Waterbury Center State Park. The Nature Trail is mostly flat, relatively short (1/4 mi one way), and great for all ages. While walking through the old apple orchard, see if you can spot three different types of birds, a squirrel, and an animal that will soon be hibernating. It's quiet and relaxing here. The perfect place to recharge.